If you're a breeder, you know how much you've got invested in each foal, even before the little fuzzy wonders hit the straw. On top of the stud fee, there's all the prenatal care for your mare, plus a whole lot of hoping and dreaming - and the last thing you want, after 11 long months of waiting and hoping, is to miss the big event. Surprisingly affordable cameras and services allow you to monitor your pregnant mare at home and online. Want even more help? With some video systems, you can even enlist a worldwide network of fellow horse-lovers to help you keep an eye on things! Why install a video camera? You can observe your mare for signs that she is going into labor - such as restlessness, pawing, lying down and getting up - without having to camp out in the barn. Mares can actually control, to some degree, when they foal, and many won't get on with it if they feel they are being watched. With a video system, you can observe without disturbing your mare (not to mention every other horse in the barn). Video systems can also alert you to other signs of trouble, such as colic symptoms or a horse getting cast in her stall. Though the chances of a mare foaling during the day are smaller, you'll enjoy considerable peace of mind if you can observe your mare from your workplace. Should she go into labor, you can at least make some phone calls and jump in your car! If you stream your video to a website, you can share the feed of the impending birth with your family, your friends, and a network of other horse owners. This is not only fun, it can be a lifesaver. 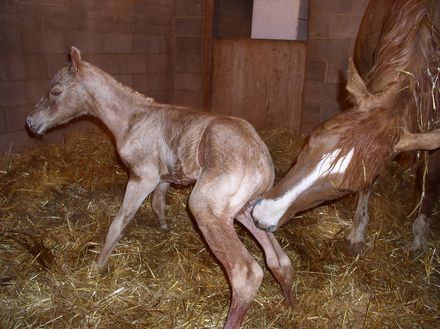 Should your mare go into labor when you're not watching - or experience trouble in foaling - your online observers can immediately alert you via email, text message, instant message, Tweet, or phone call. Another benefit of online monitoring is safety. It's always best not to work alone around animals as large as horses, but sometimes we have no choice. A video feed ensures that you can be seen - and that help can be called if you were to need it. With a video camera in place, you can record the big event and play it back later, whenever you want to relive the birth of your foal. Here is a live streaming video from our friends at Mare Stare featuring Mulligans Run Farms. There are a number of online video surveillance services available for horse breeders. Mare Stare LLC is one of the better-known, with hundreds of subscribers around the world. For a small monthly fee, your video feed can be made available in any of several different media player formats to viewers around the world, through a central portal, and a "barn alert" sends a distinctive noise to your computer as soon as one of your viewers spots signs that your mare is about to foal. Many users claim that MareStare and similar services are addictive; apparently, everyone enjoys the waiting game ... with the possible exception of the mare! 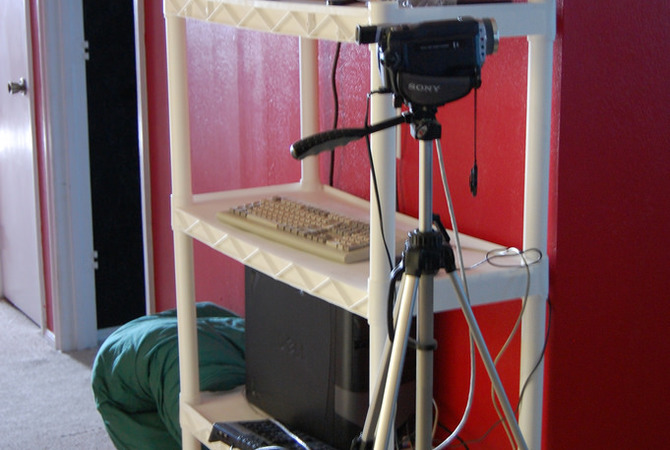 Making a communal video feed available also seems to stimulate lots of social media interaction. 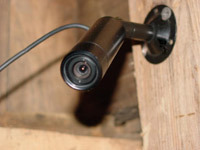 Video cameras suitable for barn use are easier than ever to purchase and install. Wireless technology now means the feed can be sent directly to your computer or TV without having to string (or bury) miles of cable. And most provide not only color images, but audio as well. Cameras designed for a horse barn must be rugged and waterproof. WebCams generally fall short. It is best to invest in a quality camera. Some companies which sell barn-ready video systems can also set you up with software and a web page so your video feed is accessible to anyone who knows the URL. Barn cameras should be rugged, weatherproof, and designed not to fog up in cold temperatures. Different models are available depending on whether you have a wooden, metal, or stone barn - make sure you choose the appropriate kit. Many barn cams operate on a 2.4 GHz wireless transmission system, which might be the same frequency as your portable phone. If the phone is activated, the barn camera transmission will be interrupted. Best to rely on a cell phone instead. Before you install extra electrical equipment, make sure the wiring in your barn is up to code and can handle the extra power drain. Night viewing in your barn might require the installation of red floodlights. These cause minimal disturbance to the mare, but still allow you to see what is going on. Some cameras do come equipped with an infrared option which gives coverage of a stall even in total darkness. In low light conditions, the feed may change from constant video to still images that refresh every few seconds. You should position the camera so it's well out of reach of your horses but can still provide a good view of the entire stall. Remember that during daylight hours, you might have to deal with shadows and light from nearby windows. If you can, bring a portable monitor with you into the barn when you're installing the video cam - that way you can see and adjust the height and angle of the camera before you commit to a location and make it permanent. Corner mounts usually work best. Although you won't need to run wires from your barn to your house with a wirelesss video system, there will be cable running from the camera(s) to the transmitter, which is generally mounted on the outside of the barn. Make sure you position these wires safely out of reach of humans and horses. Barn cameras come in several different focal lengths. The manufacturer you work with should be able to help you choose the right one for your situation, depending on whether you want to monitor a single stall, multiple stalls, or a large loose-housing area. You can also purchase video systems which will give you multiple cameras and multiple feeds, all sent to one screen. Having a video record of your mare's behavior leading up to, during, and after foaling is not only interesting, it can be a valuable record to which you can refer should you breed her again in subsequent years. And, of course, the same can be said for recording her new baby's first hours. But the biggest benefit of installing a video camera is probably the peace of mind that comes from knowing that when the big moment comes, you are going to be there to welcome your new foal into the world. For medical service providers (vet clinics and hospitals), webcam access must remain private to protect their patients and owners. If you need protected and private access, contact the service providers mentioned below to find out about their services. Karen Briggs is an award-winning freelance journalist, photographer, editor, and media relations professional who has authored six books and written over 5000 articles for horse magazines in Canada, the United States, Europe, and Australasia. Based near Toronto, Ontario, she is an Equine Canada certified coach, has a background in equine nutrition, and dabbles in three-day eventing. She shares her life with three off-the-track Thoroughbreds and a Hackney/Shetland cross pony, has advanced degrees in stall-mucking and hoof-picking, and also likes to write about science, health, agriculture, and travel. You can visit her blog, Writing From the Right Side of the Stall, at http://ridexc.wordpress.com.